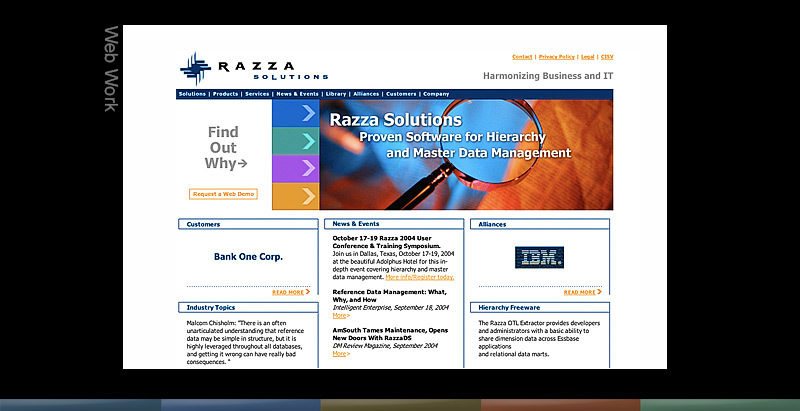 Razza Solutions, Inc., headquartered in Austin, Texas provides financial and business intelligence software products and solutions to clients worldwide. Over 20 Fortune 500 companies representing several hundred users chose RazzaDS™ product to fulfill their end-to-end hierarchy and master data management needs. Razza hired Ellis initially to provide a logo redesign, and then provided all kinds of communications to Razza before the successful sale of the company.